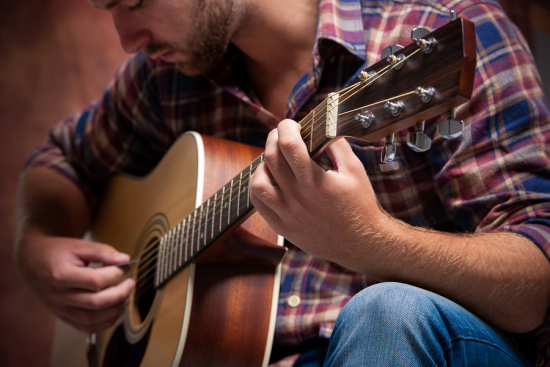 Acoustic guitar is a staple instrument across a variety of musical genres from Folk and Country through to Pop and Rock, so there’s every chance you are going to be recording one on a regular basis. Here are our top 5 tips to getting a great sound when recording. You might be surprised at what they are! Make sure the guitar has new strings on it. Guitar strings are a sponge for grease and grime, they would be a CSI’s dream, very soon even a new set of strings can start to sound dead and lifeless. If you are making the effort of capturing tracks then spend $10 and put a set of new strings on your pride and joy. Depending on the time you last did it then it might sound like a new guitar. Your guitar may have a built in pick-up, that might be great (possibly) for live work but not for the studio so get a good microphone to record your guitar. If you’re on a budget then choose a good all rounder there are plenty of great microphones for those on a budget these days for around $150. These microphones have a multitude of uses from vocal through to instrument recording. If you have few bucks and have the budget for a dedicated mic then call up a good dealer and get some advice. Not to strum with that would be plain silly, but test the microphone position with the guitar. If your not in a large studio with separate rooms and recording at home then the best way to do this is to put the mic through your headphones and the move the guitar around whilst listening to the results. Moving the mic further away wlll give you a more natural room sound, close up will give you more attack and body. Move the guitar around and you will hear the sound change dramatically. Relax and play! Studios have the effect of turning even some great players into a wreck. The best thing to do is to relax, play, do several takes and then have a listen back to see what’s working. If you have someone who is going to pieces then tell them you just want them to play along whilst you do some adjustments, but record it - I’ve got some great performances this way. The acoustic guitar is one of my favourite instruments, try these tips and you should get some great results.